A large number of mutations causing cystic fibrosis (CF) have been reported. In an attempt to improve methods for genetic diagnosis and for heterozygote screening, we evaluated methods for efficient analysis of the ΔF508, G542X, G551D, R553X, and N1303K mutations. We found that multiple mutations can be analyzed simultaneously using hybridization with allelespecific oligonucleotides. Alternatively all of these mutations can be detected by amplification of DNA followed by restriction enzyme digestion and analysis on polyacrylamide gels. A previously reported method for use of modified primers for DNA amplification to allow detection of virtually any single-base change by restriction enzyme analysis proved particularly useful. The common ΔF508 mutation and three mutations in exon 11 were analyzed using a multiplex amplification reaction followed by double digestion with restriction enzymes and electrophoresis in a single lane on a polyacrylamide gel. 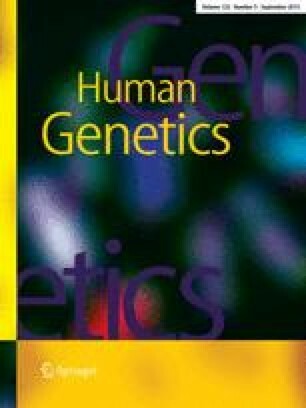 In a sample of 439 CF chromosomes from North American Caucasians, the frequencies of various mutations were as follows: ΔF508=75.8%, G542X=2.7%, G551D=3.2%, R553X=1.4%, and N1303K=1.4% for a total of 84.5% detection of CF chromosomes by analysis for these five mutations.